*This story originally ran in USA Today, as part of my syndicated series for USA Today and Gannet. I just used an eyebrow brush to brush my teeth. Nope, not an accident. It was pretty genius life hack, if you ask me, since I forgot my toothbrush on a work trip, had only three hours to get any sleep (so no time to hunt a real one down). And it worked quite a bit better than the free plastic one the hotel offered up. See — we harried, hurried, busy working parents are pretty darn resourceful when we need to be. Cue the holidays. Every year I love to think that I’ll have enough time to organize, plan, cook, clean, decorate, shop, mail out holiday cards, go to parties, and stay sane through it all. Ha! Truth? Real life is busier and messier than ever. So rather than stretch myself too thin again this year, I turned to some of the world’s savviest life-hackers — who taught me how to outsource all kinds of holidays hassles — including the stress. You can thank me later. I have people coming for the holidays, and my house is a hot mess. It’s clean, but cluttered, with summer stuff crammed in closets, winter stuff piling up in the guest bedroom, and everyday life happening around it all. A new service called Clutter fixed it all in less than an hour. Just call the service up up and arrange a time for them to show up. They come to you, photograph all your stuff, pack it up, catalog it, and store it in a secure space nearby. Want it back? Just go online and schedule a delivery. They meet you at your doorstep with your stuff. Right now, you have to live in one of the cities they service. But they are growing faster than your collection of Christmas collectibles (I hope). Pricing: In parts of the San Francisco Bay Area, for instance, Clutter charges $84 a month for a 5′ by 5′ size storage space, $117 a month for a walk-in closet sized space. A similar start-up called Omni not only lets you store your stuff but rent it out to other people too. It’s a strange take on the whole sharing economy, but it’s working well for people like San Francisco public relations associate Chelsea Murillo. “I’m hosting Thanksgiving for the first time this year,” she wrote in an email. “Within the first hour of starting to plan I realized that getting all of the stuff I need to cook and finding enough chairs and tables was waaaay out of my price range.” So she went to Omni and rented “a table, chairs, turkey roasting rack, chocolate fountain, and a food processor — for a grand total of $50.” That includes delivery and pick-up. Sweet. Get all your holiday shopping done while you’re scrolling through your social media anyway? Yes, please! You know those ads that pop up when you’re scrolling through your Facebook or Instagram feeds? I used to just ignore them, but then my mom got the whole family those Bombas socks that kept popping up in her newsfeed. (You were curious about them too, right?) And it was the perfect “something for everyone” gift. Complain as you might about ad-targeting and the whole election-ad mess, it actually works pretty well for finding great gift ideas. Especially if you know how to train it. The next time you’re surfing through your Facebook feed and come across an ad, take a second to either give it a thumbs-up or edit it through those three little dots in the upper right-hand corner of the ad. If you click “Manage your ad preferences,” you’ll see audiences you’re a part of that influence which ads you see. You can also view and adjust your ad preferences, and find out more about how Facebook decides which ads to show you. Same goes for Instagram. 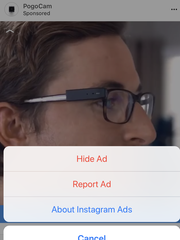 Next time you’re browsing and run across a sponsored post, click the three dots on top right to either hide it, report it or find out more about managing what’s marketed to you. You’ll also see the option to “Shop Now,” within the post, and you can see which of your friends and family have liked the same ad — which hopefully means that they will actually like receiving the gift, too. Between just those two social feeds, you can shop at 21 million businesses — most of which are small businesses. The other place you should look on social is Facebook Marketplace. This is great for scoring sold-out gadgets and finding hidden gems in your area. A lot of the time when you buy something you’re entitled to a refund if the price drops — which it almost always does — but you don’t know it. This holiday season alone, Americans are expected to lose some $15 billion in unclaimed refunds from online retailers. The Paribus app wants you to get your money back. Download the app, connect it to your email, and Paribus scans your online shopping receipts for price drops, files a digital claim, and instantly deposits the refund back to your credit card. It’s free and requires zero effort. Earny works the same way, except instead of watching your email, it keeps an eye on your credit card statement — and takes a percentage of the money it gets back for you. The trade-off: These apps access your personal information, including your email. Depending on where you live, you can get just about anything on demand these days: Food, booze, clothes, a hairstylist, presents, and now even a personal photographer! Pretty Instant lets you hire a professional photographer in your area for your family gathering, company holiday party, or even baby’s first Christmas. For me, this year is all about affordable outsourcing. From finding a new way to brush my teeth in a pinch to on-demand everything — let the holidays begin — without all the stress!